Today I’m very proud to launch a new collaboration, produced jointly by myself, Albiate and Luca Avitabile: ‘Everyday Denim’. 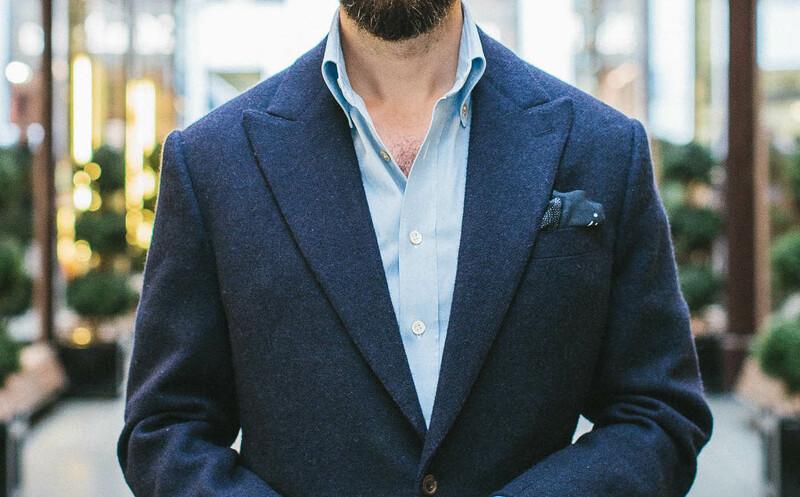 We picked the name because it is a shirt a man in a modern office can wear every day: an update on the classic blue dress shirt, that sits well with a blazer but equally a tweed jacket or a suede aviator. 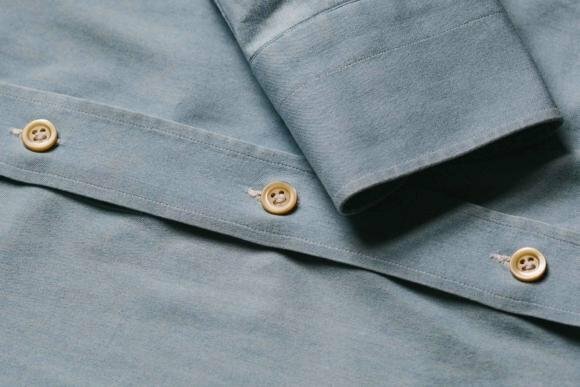 The shirt is in the same pale-blue colour as a regular office shirt - to increase its versatility - but is rendered more casual by subtle denim texture and fading at the edges and seams. And that fading only develops over time through wearing and washing. 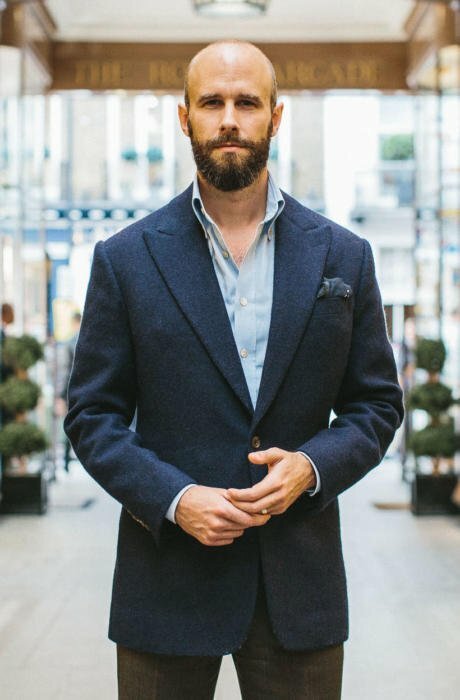 This means that if you have the shirt made bespoke, it will have no fading at the start but gradually acquire a lived-in denim look over time - something that’s often difficult with most bespoke denim. We therefore have two offers: ready-made shirts in various sizes, and the shirting itself, which can be bought and given to a shirtmaker. The story of Everyday Denim goes back a year. 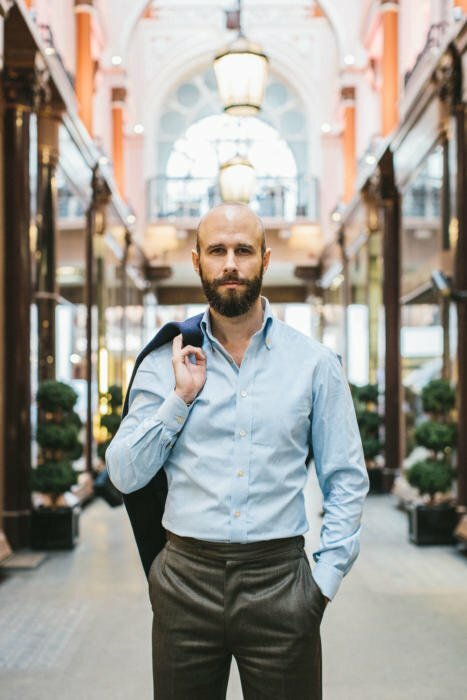 In mid-2016, I got into a conversation with Albini (owners of the Albiate brand) about why they had discontinued a version of their Victoria shirting, which I loved. It turned out that they had had returns from customers, who complained that the shirts lost their colour over time. But that was the whole point of the shirting. A core characteristic of denim is the way the indigo fades from the surface of the yarn over time, exposing the white core. It’s what makes a denim shirt look so casual and relaxed, and what designer brands spend millions replicating with washes. Those Albiate customers couldn’t deal with the fact that the product they bought would be different to the one in a month’s time, after four or five washes. But I think Permanent Style readers can. In fact, I think they will actively appreciate it. We tried several different versions of that original denim, looking at different washes and strengths of colour. The darker, more saturated ones would have shown more fading. But I settled on this classic light blue in order to achieve that everyday versatility. I wear it with a smart jacket like my oatmeal cashmere from Elia, with flannels and brogues; but also with rough Armoury chinos, under a sweatshirt. The model you can see pictured, on me and in the close-ups, has been washed six times. It will fade a little more over time, but not much. The fading effect is deliberately subtle. (Like many things on Permanent Style, I guess). As mentioned above, bespoke denim shirts are often tricky - because the thing that defines a denim shirt is the fading, and that is achieved in RTW shirts by industrial garment washing. With Everyday Denim, you can buy the cloth (which is exclusive to us), give it to your shirtmaker, and then wear and wash it over time to achieve that fading effect. And for all those that can’t reach a shirtmaker, we have ready-made shirts across four sizes. These broadly reflect the sizing of our Friday Polos, and are made in the same facility in Naples with the help of Luca Avitabile. They therefore have all of Luca’s normal points of construction: hand-attached collar and sleeves, hand-sewn buttonholes and buttons. The buttons are different though: here we went with flat, yellowed mother-of-pearl, which I think has a vintage look that suits the denim. 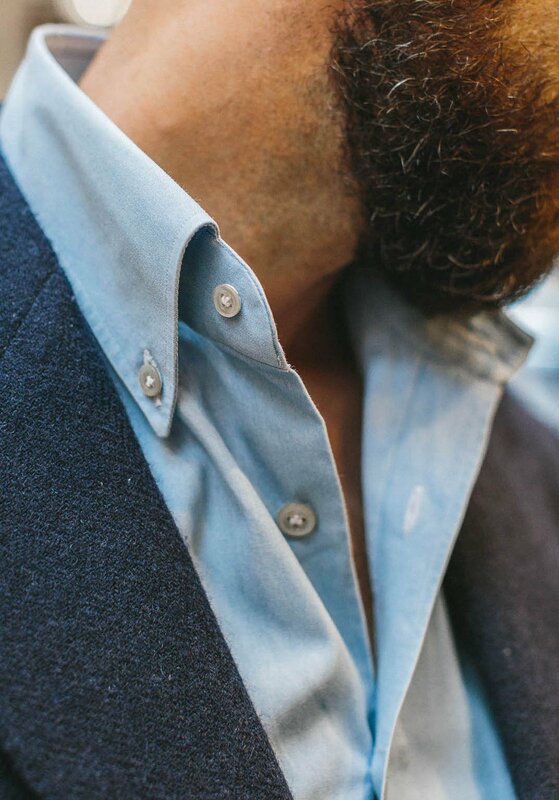 The shirts also have the button-down collar that I developed in recent years with Luca on my bespoke shirts. 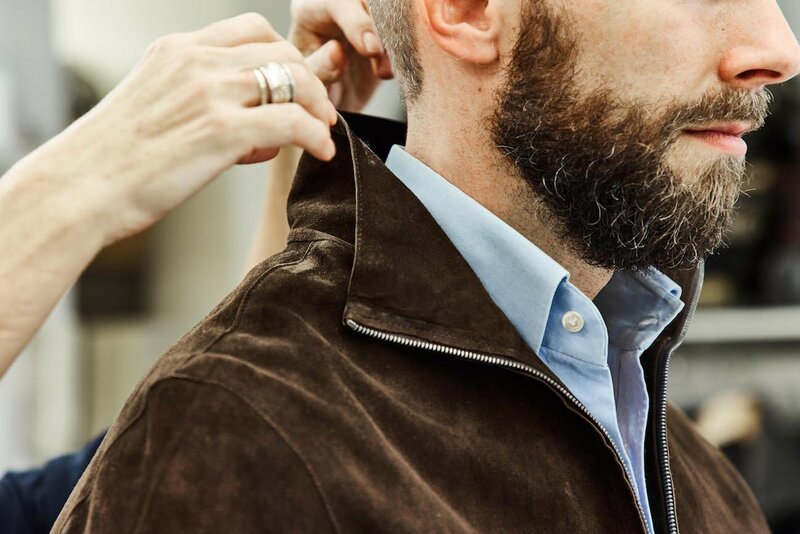 The aim of this collar is to curve subtly outwards when worn open, rolling around the collar of the jacket and framing the face. It is an effect I know readers have commented on in the past. But when the shirt is buttoned up, the collar also has enough shape to curve around a tie knot, rather than sitting flat and lifeless. It looks good both ways, and it’s lovely to be able to use something like this that has been developed for bespoke, on a ready-to-wear product. The denim is a cotton twill, using 60/2 yarn in the warp and 120/2 in the weft. That 2 refers to the ply of the yarn, which is significant with denim. Most brands use cheap, single-ply yarn - which to a certain extent is because they want a tougher, coarser feel to the cloth, but also means it doesn’t soften in the same way over time. I’ve been pleased to find, by contrast, that the Everyday Denim softens beautifully, and is probably one of the most comfortable shirts I own as a result. There are 150 RTW shirts across four sizes. Hopefully that will last us a few weeks at least, but we’ll see. The shirts are slightly more expensive than the Friday Polos, reflecting the exclusivity of the cloth, at £180 (ex-VAT). And the lengths of shirting are £55. I do hope you like Everyday Denim. It’s been a long time coming. Extralarge: neck 43 (17 inches). Ships from Naples. Details on the PS Shop. Shot in the GJ Cleverley shop in the Royal Arcade, London. Many thanks to George Glasgow, Jr (above), Senior, John and everyone else for their hospitality. You can follow the discussion on Introducing: Everyday Denim by entering your email address in the box below. You will then receive an email every time a new comment is added. These will also contain a link to a page where you can stop the alerts, and remove all of your related data from the site. why no XS again Simon? You should really start to look at producing XS across all your products! Totally agree that it doesn’t make sense to do orders of sizes that few are buying, and the option for the cloth is a very good compromise. For what it is worth for any future planning, I would buy an XS were it available. Very much appreciated adding the XS to the trenchcoats recently as that ended up a very good size for me. Yes, exactly. Put his address for the delivery and we’ll refund you the shipping cost. Apologies there isn’t an option to avoid shipping and give it to Luca – one thing we didn’t foresee! So no option to buy it all from Luca and he & you deal with each other in terms of monies and stock? No I’m sorry, that would be rather complicated in terms of transfers. Please do post your response to advise. Brilliant news… I had seen some others wearing Victoria cloth before and seen some photos online. Will Luca be taking bespoke orders on this cloth or would I need to purchase a length and hand it over to him? Purchase and hand it over – though we’re seeing if there’s a way on the system to get zero shipping charge of that’s what you want to do. That was my question as well. It would be great if it was an easy way in the check-out to get the shirting sent directly to Luca to save shipping cost. Has Luca confirmed the cost of using this cloth for a bespoke order? Which cotton chambray is that? I.e. what mill/book? No idea, I just told Luca what I wanted and he did it for me.. I am an old client of Luca and talked to him about this and he recommended that I order the cloth and had it sent to him for a bespoke shirt. (My pattern is a bit unususal). He said that the shirting could be sent straight to him. But I was a little confused about how to write this information in the Shop section. (I this is a too complicated question for the comment section, please e-mail me an response). very nice denim. But the fir does not really “broadly reflect the sizing of our Friday Polos” – when the yoke measurement on size S is 5cm wider than it is on the Polos. Or will the upcoming, changed Polos that you mentioned also have significantly wider shoulders? 45cm shoulder seems very wide on a 37cm neck shirt, whereas the chest measurement indicates a relatively slim overall fit (as the Polos). Doesn’t matter for me though, I will have it made bespoke. Hi. I’ve checked and apparently it is to do with the washing on the polos. The pique cotton tends to shrink a little in the warp, creating a shorter yoke and slightly shorter sleeves. Of course, it could be cut bigger to account for that shrinkage, but it’s not how it’s being done at the moment. Love the look of this Simon. Sorry for such a banal Q but what’s the returns policy if the sizing isn’t right on delivery? You can exchange for a new size if the shirt is in a sellable condition. If I order a XL and that comes short, can’t that be returned? Could you please add the neck measurements as well? Looks great. If I were to purchase the shirt, I’d like need to have the sleeves shortened and I’ve had terrible luck with getting such alterations done. Any recommendations for someone in London that would take on such a small job and do it properly? Could you wear it with jeans as it is a very subtle denim look or would that turn quickly into a Canadian Cowboy? That’s exactly what I plan to do but with a jacket or some form of knitwear to break it up. Could you tell me the details of the beautiful blue jacket. I’m interested in the fabric, company, book and number if possible. Great collaboration Simon. I’ve ordered the large and will get the sleeves altered. I love the cloth, colour and finish – all great choices. With this and the trench, I think your rehabilitation after cardigangate is nearly complete. Jason King would be proud of you. Would it be possible to see a photo of the collar worn with a tie? What is the advantage of a hand attached collar in the case of a RtW shirt? Hello Simon, thank you for sharing your ideas and favourite things with us! This fabric is lovely. I’m buying a length. Also, what fabric are your trousers made of, in the two first pictures. Seems very unusual but interesting. I will like to see the Swatch sample before I make a purchase to avoid returns. Its that possible? Just ordered a length – apologies if you state in the ‘blog- but how long do you anticipate delivery taking? Would you know the initial shrinkage of the cloth? So I can advise my shirtmaker how much extra to cut the length / sleeves. Thank you! Do you have a swatch sample of the cloth for me to see before I can make an order? What is the point length and spread width on the collar? The shirt looks great! These button down collars that you’ve designed with Luca, do they look as good without a jacket when worn in their own? Happy to buy a new product from your collaboration with Luca. I noticed that this new product includes taxes. Is it a new policy for the products you sell? Can’t believe the cloth is already sold out. Do you have plans for a restock, or other cloths, any time soon? If you rub white paper against the fabric will the dye come off? It is indigo dyed, yes, but it has been washed, so no dye will come off. Just wondered where you stood on topics like traditional/natural/artisan dying/textile production -v- industrialised/synthetic? Its similar to sour dough bread where you need a culture which is taken from your previous batch. The skills in dying themselves are not difficult/that different but developing and maintaining a culture that sustains itself is difficult and transplanting a culture from one site to another is exceptionally hit and miss on if it takes in the mid-long term. Cloth sold out already! Any chance for a 2nd run? The cloth has sold out , are you likely to re-stock anytime soon. Pitty, unfortunately Luca hadn’t confirmed his costs yet so missed out as whilst it looks great can’t write a blank check for a single shirt. Hope it’ll be restocked in time for this season and maybe better coordinated with Luca for his customers. Is it likely to be in time for this season factoring in the month or so for making the shirt? Pitty missed out, was waiting for Luca to confirm costs as whilst its great theres only so much I can justify spending on a single shirt. Would be good if you could work a way of being more coordinated with Luca on the next batch. Will do Bob. To be honest I didn’t expect so many people to be using Luca – thought there would be more of a spread! I haven’t heard anything back frmo Albini yet, but I’ll let everyone know as soon as I do. Damb! I was planning to order this morning. I’d certainly be interested in a second batch of cloth if that’s a possibility Simon. The cloth sold out very quickly any chance Albini will produce some more. Lovely shirt Simon. You’ve “hit it out of the park” with this and the trench coat. I note the neck size is 14.5 inches on the small which would be rather tight for me when done up. But that’s a moot point since the shirt is beyond my budget. Even if I can’t buy these collaboration products keep them coming Simon. They are a great example of quality clothing and a standard to evaluate things I do purchase. Very nice blue jacket Simon ! Judging by the speed with which the cloth ran out ( and the shirts will sell out soon ) , my faith in humanity has been restored! Please continue to do such offers , Simon. There is a very, very strong return to solid values and virtue in society. We’ve had enough of brands, advertising , marketing and all the bullsh*t and the increasing popularity of this blog and the products you sell proves it ! Simon, It seams you are ordering a lot of leather and suede jackets recently. It looks wonderful. I am considering ordering a leather or suede jacket myself. Maybe you could share your experience on care – what happens with rain, sweating ect? Do you do some special treatment of the jacket to prevent stains from rain or sweat? Ordered yesterday and when I came home this afternoon is was in the mailbox here in Denmark. Fastastic delivery speed. A few comments that might be usefull for others: i normally buy size 40/M and im 189 cm tall. Previously ive ordered the Friday polo (short and long) in size M and they are both a little to thight for me over the chest and under the arms (im a skinny guy). When I say the measurements for this shirt and compared it with the polos i decided to go for size L (dont use a tie). Im glad that i did. Body with is fine – its a bit long for me but works well when tucked in. Looking foreward to use it. The jacket you are wearing is looking very nice, but i can’t stop thinking the sleeves are to wide. Is this something you have asked for? My first purchase Simon, but Morten’s comment has me worried. I’m a 42 ( 6′ and 180 lbs) and just ordered a size L.
Where is that beautiful suede jacket from? Not the zipper, the other one? That’s my Sartoria Melina jacket – review coming soon. This looks lovely Simon but am I misunderstanding how the sleeve length is measured? The extra large has a sleeve of 70 cms, which is more than 20 cms shorter than the sleeve on a T&A standard RTW 43 cm neck? 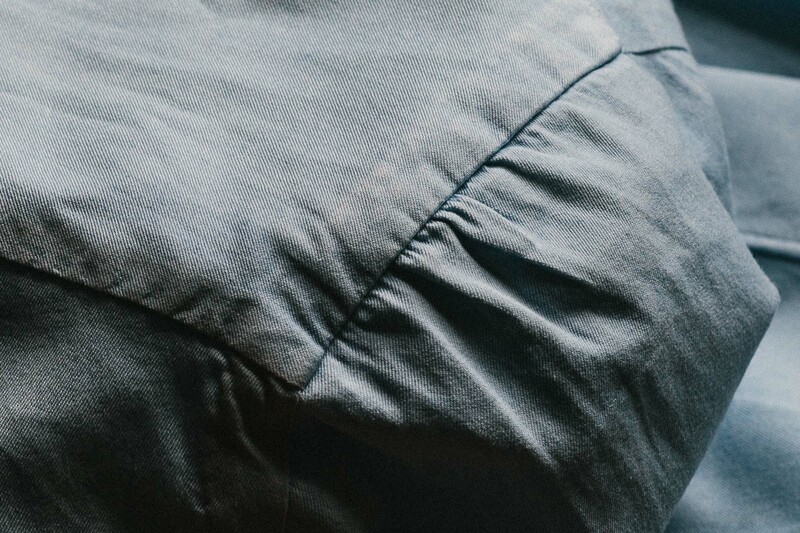 Ours is a measurement of the sleeve itself, from the top where it joins the shoulder. The T&A shirt you refer to probably measures from the middle of the yoke. Great success, Simon, well done. ps: Looking forward to receive my shirt next week. BTW, any plans to restock the Friday polos in the sold out sizes? Polos coming again in November, with some tweaks on style. Really love the look of this one, unfortunately I’m too big to fit into the XL (I do wear XL in the polos, but those have some stretch. 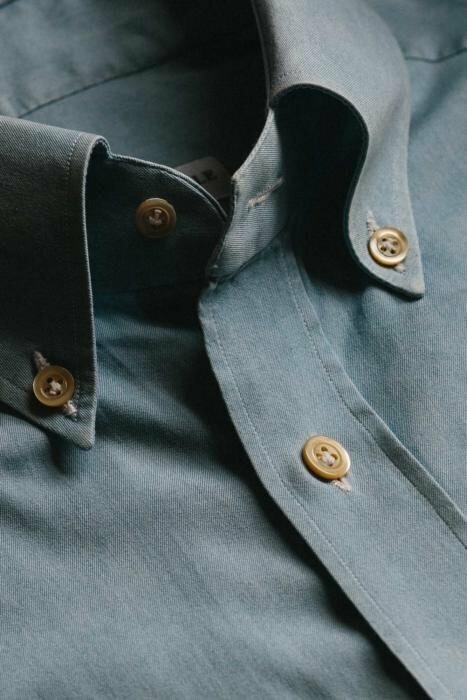 If you do get a second run of cloth, would you consider opting in the buttons as well for a small surcharge?, or would those be exclusive to Luca? I quite like the look of them. My shirt arrived in the UK this morning. It looks fantastic, body and sleeves a good fit for RTW. The collar might be a bit snug but I am unlikely to wear with a tie. The roll on the collar is just lovely. The question is……do I wash before wearing to start the fading process or not? Decisions, decisons! Dear Simon, can you deliver this tessuto to D’avino which is my best shirt maker ever ? The fabric is a lighter weight than I was expecting – somehow the pictures make it look more denim like, more substantial. This is not a negative – just an observation. The fit is midway between other RTW such as Eton normal and slim (in the large anyway). The pictures don’t capture some of the really nice detailing around the sleeve buttons. Did I mention that its beautiful? Received shirt yesterday. All the different details highlighted throughout the comments are nicer in person, than in the pictures. Emailed you (Simon) for an exchange (I bought a XL and need a L), just waiting for a response (I’m sure you are very busy). Just some sizing info for others – I wear a XL in the Friday polo’s, as I’m in between a L and XL normally, and would rather my shirts a touch loose, rather than a touch tight – as is typical with other makers, button down shirt fit a little looser, and I definitely need to size down to a L in this. I’m not sure if it’s the material, or styling. Since I’ve been a reader of the site I have purchased every collaboration that was made, and I have been thrilled with each and every item. They all seem to fill a void. Interestingly, I find people have reacted rather differently to the difference between the polos and the shirts. With the polos, I’ve always found most people can wear two sizes, depending on how close they want it to fit. There’s so much stretch that it’s rarely uncomfortable. That’s not the case with shirts, however. Some people have actually sized up, where you are sizing down. Have you thought about doing a pop up in Bicester Village? Your Permanent Style followers are probably guaranteed to visit you as much as they did when you were on Saville Row plus general footfall at Bicester, I would have thought would be great. I don’t think so Joel, to be honest. 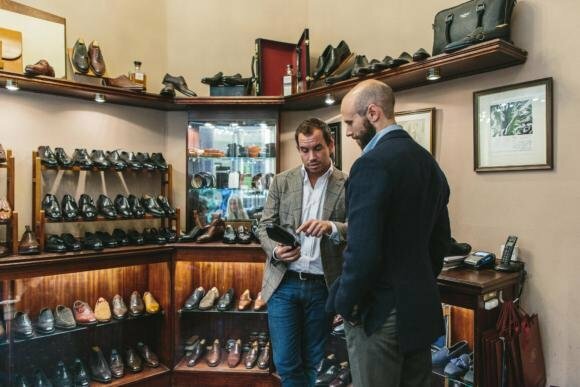 It’s quite a long way to come, and most of the shoppers there are looking for things on sale, rather than for top-quality niche menswear at full price. Hopefully today and tomorrow – Naples have been rather swamped I’m afraid. Arrived this morning. Fantastic, not actually what I expected it’s closer to a cotton twill in feel and weight with look of a brushed cotton. It’s actually going to be much more versatile than most denim fabric. You only normally find a cloth like this in designer RTW at the moment. Think I may need a 2nd length when available. If successful maybe a few other shades can be introduced in the future? Do you have any indication of when customer’s can expect to receive their shirt lengths? I’m one of the lucky ones that snapped up a couple of lengths while they were in stock but haven’t heard anything regarding dispatch. Thanks. Mine arrived this morning. Looks great! As a separate issue, what’s your opinion of other colours for denim shirting. I was against it but bought a grey selvedge denim shirt from Jeans-Shop New York and found it to be very flexible. I think why it works for me is that the fabric is quite pale; in fact a similar colour depth (and weight) to the PS denim. With MOP buttons it becomes an interesting casual shirt rather than a piece of cowboy costume..
No sooner do I post my comment and the shirting arrives… And just in time for my father’s birthday tomorrow! I’m stunned by the quality and handle of this denim, I’ve never felt anything quite like it. Congratulations (and thanks) on another successful collaboration and product. Simon, I received your shirt last week and am equally impressed by the cloth and make. It fits nicely in the body and the arms, but unfortunatly due to my broad and high shoulders there is an excess of cloth around the collar and tension if not worn completely buttoned up. I should have ordered the cloth, but was too curious about your collar. So I wanted to ask if I could return and exchange it for a lenght of cloth and a refund? Yes if the shirt hasn’t been worn and is therefore still sellable, you can return for a refund. Then just go ahead and make a purchase of the cloth. Hi Simon. Can I please know more about the fabric construction – ends per inch (warp) & picks per inch (weft)? Placket on oxford cloth or not! I see you went for a placket on this less formal shirt. 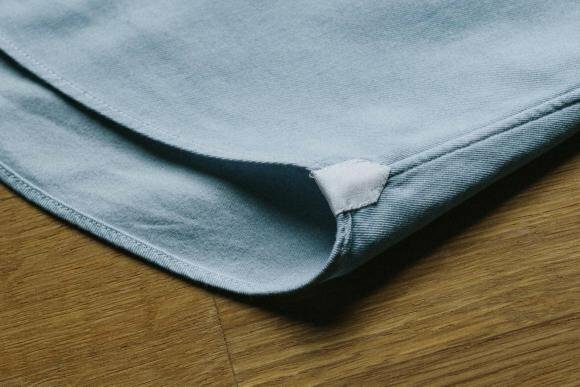 I`m in the process of getting a shirt made in plain lighter blue oxford cloth, without a placket, with a wide spread cutaway collar. I like the cloth but want to use it for suits and more casually. I feel a placket sometimes become too chunky on oxford cloth. Whats your general view on when to choose a placket or is it only personal preferences? A placket will generally be more casual, and it’s mostly used on more casual cloths and designs. So it’s worth avoiding if you want a shirt to be smart. 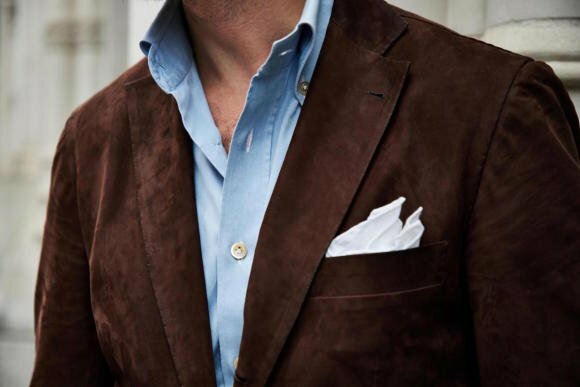 With your example, there is a risk that the shirt will look odd with a casual cloth but very formal design. But it depends on the cloth – oxford is a type of weave, and with a finer cotton and less variation in colour, it can still look quite smart. Apologies if this has already been asked elsewhere, but would you advise against washing this in a normal washer at home? Assuming friendly/delicate settings, no harsh chemicals/detergents and then hang/air dry afterwards? Thanks – love the shirt, the fabric is delightfully soft and the collar is really great! I finally have the XL and apart from the fact that the sleeves need shortening (no problem I’ve a local lady who is great at this) it fits fine. That said, I’ve measured both the L and the XL against some Dunhill and Brioni flannel and denim shirts that I have and there is no doubt that your XL corresponds completely to their L. Hence the back and forth over this. That withstanding, the shirt is beautiful. The cloth is off the richter scale and the collar roll is absolutely fabulous. The next project should be a grey flannel in exactly the same style. Thank you David, and very useful to know on the sizing. Received my L (instead of the original XL that I purchased), and like the previous poster fits absolutely perfect aside from needing a minor shortening of the sleeves. Collar roll is spectacular, and the material is extremely comfortable. Definitely hit a home run with this. I’m thinking of buying some of the cloth as well, and having another shirt made up without a button down collar – would you recommend this? Or is this too redundant? This way I have a more casual button down, and then a slightly dressier with a standard collar of some sort. Simon – I’d be grateful for your help. I ordered a length of cloth from the first run to be delivered to Luca. I received confirmation of the order (#1181_PS). However I have had no word from Luca that the cloth has arrived with him (I have emailed him twice). Could you look into this and confirm that it is with him? Secondly, you mentioned that you would be refunding the shipping for those of us that sent it to Luca. How is that going to work? Hi. You should have the shipping refunded within a week. If you haven’t had that, please email me and I’ll double check. On cloth going to Luca, I think it’s best if you wait for him to respond and confirm, rather than me just email him as you have done, and pass on any reply. I’m sure he’ll get back to you, but I know he’s been very busy lately. is it the darker side of the clothe, the “good” outer side? What is collar construction for these shirts? If I get my dress shirts wash & pressed/ironed by the cleaners, how do I ensure that the fusing in the collar does not shrink? Also, will the everyday denim & PS oxford still fade if I don’t launder them at home and use a professional dry cleaner like Mulberrys?